In medicine, humor refers to a fluid (or semifluid) substance. Thus, the aqueous humor is the fluid normally present in the front and rear chambers of the eye. It is a clear, watery fluid that flows between and nourishes the lens and the cornea; it is secreted by the ciliary processes. 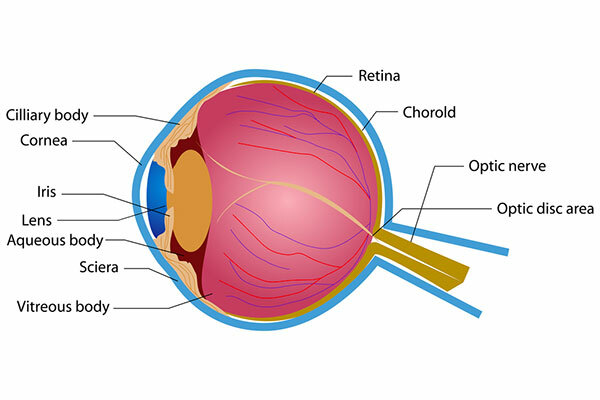 The choroid is the vascular layer of the eye, containing connective tissue, lying between the retina and the sclera. The ciliary body is a circular structure just behind the iris composed of the ciliary muscle and ciliary processes which attach to the lens. The ciliary processes secrete the aqueous fluid, and the ciliary muscle modifies focus by changing the shape of the lens. The clear front window of the eye, which transmits and focuses light into the eye. The cornea is more than a protective film; it is a fairly complex structure that has five layers. The circular, colored curtain of the eye. The opening of the iris forms the pupil. The iris helps regulate the amount of light that enters the eye. The transparent structure inside the eye that focuses light rays onto the retina. The optic disc or optic nerve head is the point of exit for ganglion cell axons leaving the eye. The ganglion cell axons form the optic nerve after they leave the eye. The optic disc represents the beginning of the optic nerve. The optic nerve connects the eye to the brain. The optic nerve carries the impulses formed by the retina, the nerve layer that lines the back of the eye and senses light and creates impulses. These impulses are dispatched through the optic nerve to the brain, which interprets them as images. Using an ophthalmoscope, the head of the optic nerve can be easily seen. It can be viewed as the only visible part of the brain (or extension of it). The opening of the iris. The pupil may appear to open (dilate) and close (constrict), but it is really the iris that is the prime mover; the pupil is merely the absence of iris. The pupil determines how much light is let into the eye. The retina is the nerve layer that lines the back of the eye, senses light, and creates impulses that travel through the optic nerve to the brain. There is a small area, called the macula, in the retina that contains special light-sensitive cells. The macula allows us to see fine details clearly. The tough white outer coat over the eyeball that covers approximately the posterior five-sixths of its surface. The sclera is continuous in the front of the eye with the cornea and in the back of the eye with the external sheath of the optic nerve. Vitreous: A clear, jelly-like substance that fills the middle of the eye. Also called the vitreous humor, "humor" in medicine referring to a fluid (or semifluid) substance. The Vitreous Body is the clear, colorless transparent jelly that fills the posterior chamber of the eyeball.